I Spent a Few Hours with Oculus Go. Here Are My Thoughts. Among the more popular complaints about virtual reality are the practicality and the price. Most VR devices are expensive and require a lot of space in your home. 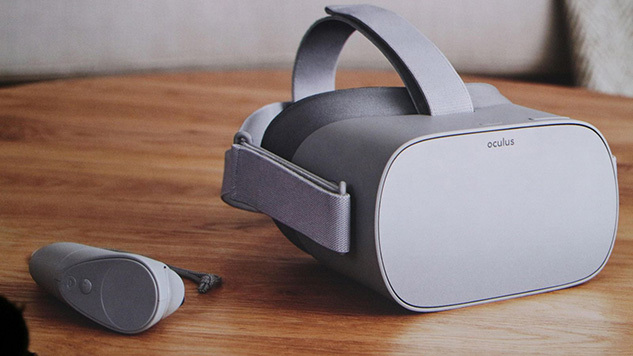 Enter the Oculus Go, a 32GB, $200 version of the Oculus Rift that runs content from an app you download from your smartphone. Touted as an affordable entry level headset for those at a “beginner’s level” of interest in the VR platform, Oculus Go is wireless and portable. But does it offer enough entertainment value to become a regularly used device in my already tech-optimized life and home? The company sent me a courtesy unit, and with that this week, I set out to find out. First things first: taking it out of the box and setting it up. In terms of physical design, the device is made with quality materials. The plastic is smooth and feels sturdy. The strap has a nice stretch to it and a good level of resistance. Set-up requires downloading the app on a phone from the Google Play store, and from there, signing up for an account. A set of prompts then walk you through the syncing process, with clear and easy to understand photos to help you pair your phone. After that comes enabling Bluetooth and location access, entering a Wi-Fi password, setting up the controller, optimizing for hand preference, inputting payment method, then reading through some more instructions and health and safety warnings. It’s a lot, but it goes by quick; the process is efficient and speedy. Putting on the Oculus Go, I noticed it’s not built to accommodate anything but a single hairstyle: none. Be prepared to undo your updo if you plan to play. The straps on the device, one of which goes around the back of the head, and the other, vertically from your forehead to the back of your head, accommodate multiple head shapes and sizes and are Velcroed into place. The design is simple and I figured out how it was “supposed” to work quickly. In practice, it was more difficult. The Velcro comes undone a lot, and my long hair got caught and caused the straps to slide around many times. I was able to find success eventually but only after pulling the straps uncomfortably tight. After securing the device on my face, it felt much bigger and heavier than I expected. 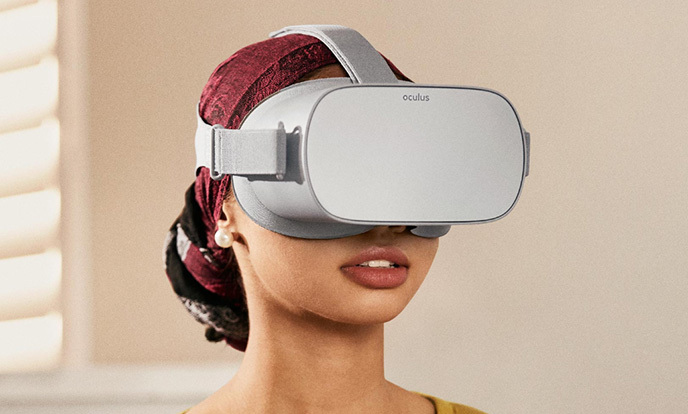 The Oculus Go has been touted as small and light, but the lower rim of the headset goes down past my cheek bones. Without this key bit of scaffolding, the weight is a bit much for my neck and face. The controller, however, is light and easy to grasp for long periods of time. Turning it on, the interface of the Oculus Go hub and its accompanying audio are very clean, almost soothing, and it looks clinically posh in terms of design. The resolution however seems off. Everything just outside of where I’m looking directly is blurry (and I don’t have bad eyesight). Tooling around the library, I decided to try out some of the free apps, the most popular ones in the Oculus Go marketplace. Netflix is among the most downloaded. As I took in the coziness of its virtual living room, for a moment, I could almost see the appeal. It’s very easy to forget the rest of the world exists when you have that headset on. Curiously, despite that Oculus is a Facebook product, Netflix would not let me use my Facebook login, and asked me to sign-in manually. My email and password are both at least 25 characters long. After making several mistakes, I became daunted by the prospect of taking the headset off to deal with a password reset email on my phone, so I gave up and moved on. Next I tried Jurassic Park Blue. My time with it was brief. The menu invitation to play the full experience led to a page that said “coming soon”, and playing the first chapter was an exercise in frustration. Was I supposed to stream it, or download it? Concerned with conserving space, I decided to stream. But despite my superior connection, it then lagged. So I exited, and tried a rollercoaster game that looked fun and was well reviewed. I figured it would be a good use of the first-person VR experience. However this too ended in disappointment. Its production values were abysmally low and the track was boring. I left after completing only one course. Returning to the marketplace to see if a paid game caught my eye, I browsed the offerings there. Nothing seemed like something I’d take a risk on. But, determined to explore some of the other uses of Oculus Go, ones that I personally don’t have an interest in, I checked out some of the free 360 videos, which a lot of people seem to enjoy. As it turns out, I liked some of the news stories. Being able to turn my head and see a full room, as if I were there myself, is a marvel. But the novelty of these 3D atmospheres comes off more like a tech demo. I’m not sure I would seek out the experience regularly. I don’t need to feel like I’m physically in the Disneyland plaza to enjoy a trailer for Jungle Book. My first Oculus Go session lasted about 60 minutes, until my area of focus became as blurry as my peripherals. When I put the device on, I had about a 30% charge, and received a “please charge your Oculus” warning shortly before I stopped playing. This seems more or less aligned with the purported 1.5-2.5 hour battery life that other users are experiencing. I would have continued to play while charging, but they seem to have deliberately designed around that impulse by providing a very short charge cord. After getting a full charge overnight, the next day I spent some more time browsing the content, but still struggled to find anything that justified the 3D aspect of the experience. It seems like most of what is offered is enjoyable if you’re already determined to like virtual reality. For example, there’s a charming little game that lets you paint in the air, using your outstretched arms and fingers to make your own art. I have no organic interest in playing something like that—but if I were fascinated by VR, maybe I would. In that sense, the medium still hasn’t learned to design for general interest, which doesn’t bode well given the intended consumer audience for the Oculus Go. Ultimately this is a very strange product to me. Watching 3D videos of someone else’s vacation on Facebook for a rough half hour doesn’t strike me as the funnest way to live. It doesn’t seem practical either. Why would I want a VR headset for stuff I have better options for? I have a TV, a smartphone, a 3DS and an iPad; I don’t need to watch Netflix in VR. What I would use the Oculus Go for is playing quality games and apps that I can’t get in any other format, that make practical and integral use of the 3D feature in a way that can’t be dismissed as a mere amusement or novelty. Right now there seems to be little of either. The stuff you actually pay for may have some promise, but with such a weak showing in the free content, and my lack of confidence that I’ll use the device on the long term, I’m not willing to take the risk. And even the best library in the world can’t make up for the limited time I can even use the device. It’s not comfortable enough to wear for the duration of an entire movie, so why would I use it to watch one? None of this makes any sense. As I finished up this review, I quickly Googled the device to check the styling of its name and out of curiosity, clicked an Amazon link to see what the positive user reviews about Oculus Go were saying. Unsurprisingly, they’re mostly glowing—but also mostly from VR enthusiasts who are already supportive of the platform. I suppose if you enjoy VR and want to like Oculus Go, you’ll find your reasons to. But personally, this was Oculus’s big opportunity to prove its value to me, and it failed. So I guess you could say, it’s an Oculus No-Go. If you like gaming, save your money and buy a PC or console based VR device.